Step 1 Heat the oven to 350 degrees. Blanch the asparagus in a large pot of boiling water for 3 minutes. Drain and pat dry. Place in a bowl. Step 2 In a medium saute pan over medium-high heat, saute the leeks with the shallot in 4 tablespoons of the butter until transparent. Add to the bowl of asparagus. Step 3Place the almonds on a baking sheet and toast them in the oven for about 8 minutes, until golden. Step 4Add the almonds, Gruyere, eggs, mint, parsley, dill, chives, salt, pepper, paprika, cayenne pepper and lemon juice to the bowl of asparagus. Toss together. Step 5Butter a large baking sheet with melted butter. Lay 1 leaf of phyllo on a work surface (cover the remaining phyllo with a damp cloth), and quickly brush with melted butter. Repeat until you have six layers. Step 6Place half of the asparagus mixture along one short end and roll up jelly-roll fashion, thoroughly tucking the ends in as you go. Place on the baking sheet. Proceed to make the second strudel with the remaining phyllo, butter and filling and place it on the baking sheet, leaving ample space between the rolls. Brush the tops of the rolls with any remaining butter. Step 7Bake until golden, 40 to 45 minutes. Cool slightly and slice crosswise into 2-inch pieces. In Recipes-list.com we have selected the most viewed recipes from category - Sides Vegetarian . Enjoy the best recipes specially selected for you! 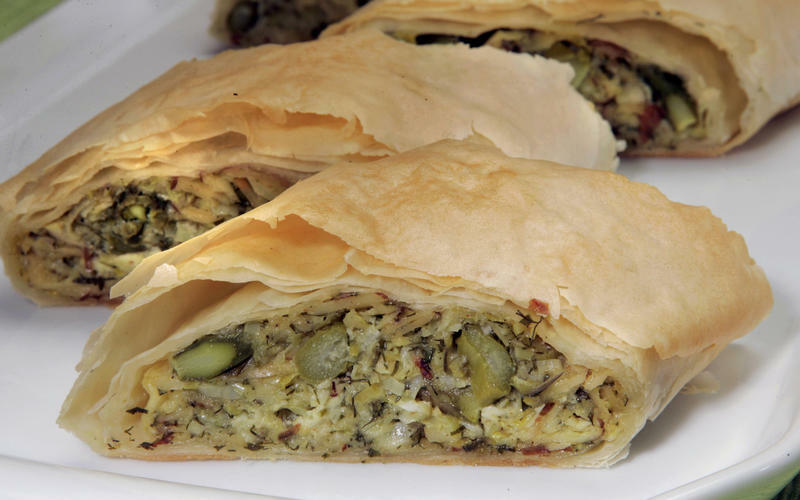 Asparagus strudel is the right choice that will satisfy all your claims.